I am in the middle of restoring the Broyhill Brasilia set of dining chairs and boy are they beauties! I love the fabric I chose with the deep walnut finish. Two chairs are finished, 2 more need seats done and structural issues tended to. I hope to have them finished and listed in the next week. IF YOU ARE INTERESTED, please reach out as I can do a private listing for you. These chairs were pretty rough when they came to me and I uncovered the original seat fabric. They were in a less than stellar storage situation and quite frankly, they were pretty gross. I stripped down to the plywood and replaced the foam and cotton, then covered in the beautiful PURE WATER fabric by Joybird. It looks so pretty! Here is a sneak peek! The first 2 chairs are finished! They cleaned up very nicely! Some more work to do on the last 2 but hopefully will have them done this week. 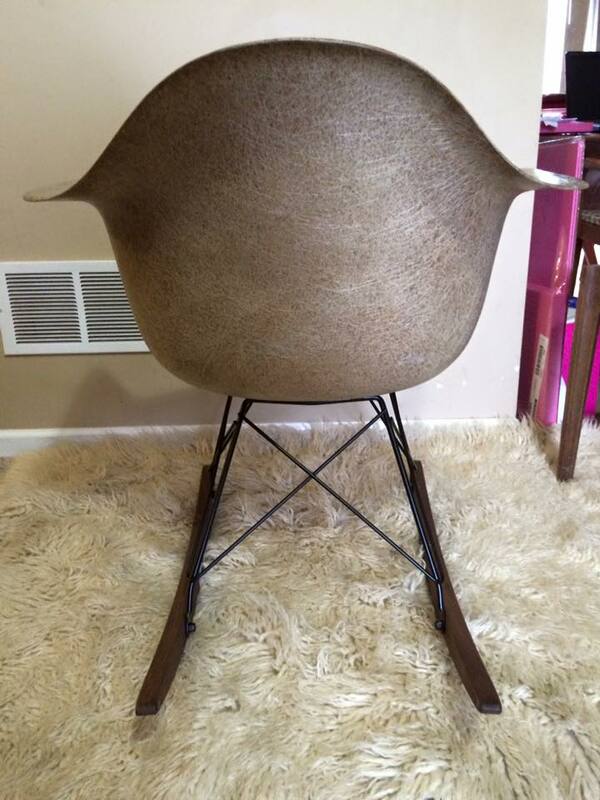 Next up, I also spent some time cleaning the Zenith made Eames shell chair I bought! A little scared of the fiberglass, it really cleaned up much better than I expected! It is such a lovely color, GREIGE. 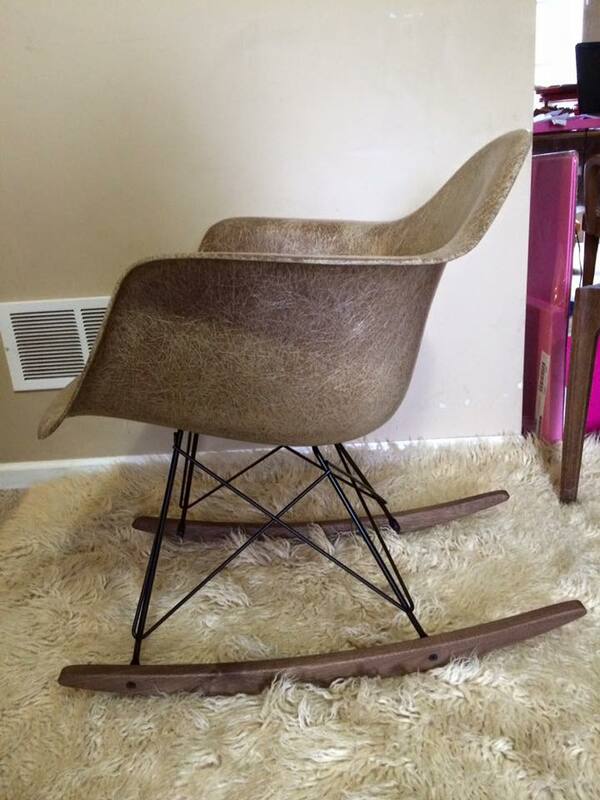 The rocker base came from Modern Conscience and boy is it nice! Very well made and very sturdy. I am thrilled with it! I am not ready to part with it just yet…..it is a nice compact size and fits in a smaller space, unlike any of the other chairs I have tried to keep and realized they were too large for my intended area! The good news is, I am planning to visit my friends again real soon and there is another shell there I could buy so I am thinking of picking that one up to do for sale. I will keep you guys posted, It was black fiberglass with black vinyl upholstery. 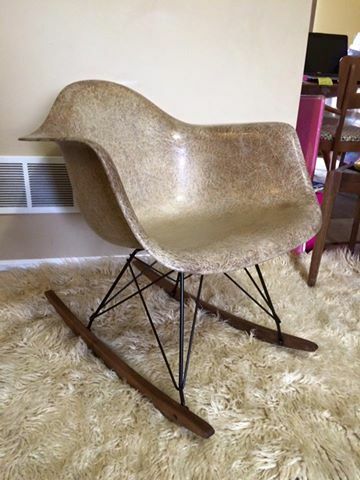 It was in decent shape but may have some gluing to do on the upholstery. I am really smitten with the rocker base and glad I went with the Modern Conscience piece as the black hardware just makes the piece, in my opinion! What do you think? PYREX AND RETRO FEST! I will be participating in the PYREX AND RETRO FEST hosted by JoRetro Vintage Market in Havre De Grace, MD….OCTOBER 8th. I have the flier pinned to the top of my Facebook page with the link to the event info. Facebook.com/madformodmalissa I hope to meet some friends at the event! It should be a fun day and looking forward to spending the afternoon in this cute bayside town. I plan on taking my 3 totes of pyrex items, a very cool cosco cart, and a bunch of my wholesale items like the Indian Kantha Quilts, throw rugs and kitchen towels. If you want me to bring something for you, please shout! I will do whatever I can to accommodate any requests. We are expecting as many as 30 vendors and of course, JoRetro is open for shopping! Jolene has many fun things planned and many super exciting items coming in! There will be pyrex jewelry, stickers and more. You should definite plan to attend! A great day trip from DC, PA, NJ and MD. Please look over my shops and let me know if I can bring something for you! EVENT LINK This is an outdoor event. Please pack appropriately for the weather! Food and vintage vendors galore! Mall update: I revamped my booth again yesterday! The kitchen set has sold and I am putting it on the bus in the morning. :) Yea! I moved in the turquoise Carsons club chair….the last piece I have from that awesome set which is in impeccable condition! Priced at $300. Also on display is the limed oak top side table with hairpin legs. Its is gorgeous! Stop by and see them! Extravaganza is still going on tomorrow in Kutztown and always lots of yard sales in the area! Sunday, it moves to Adamstown but we are only a 1/2 hour away with much better prices!